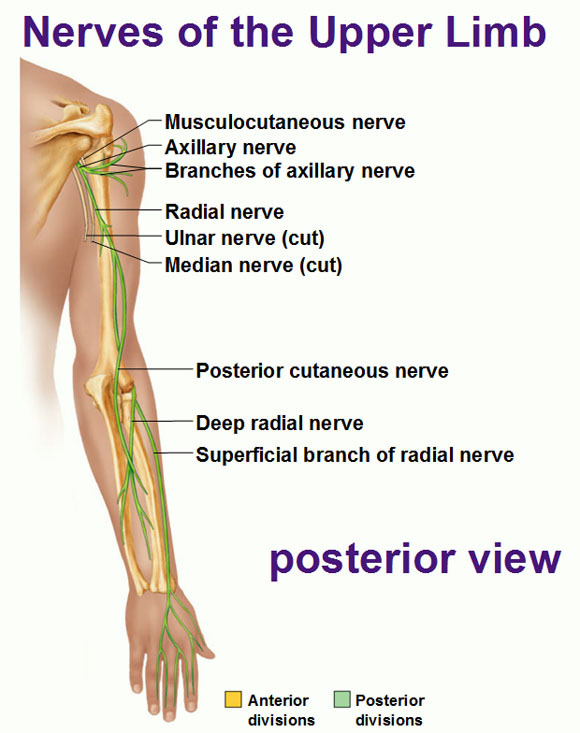 We have 31 pairs of spinal nerves and they are named after the section of the spine they come out of. 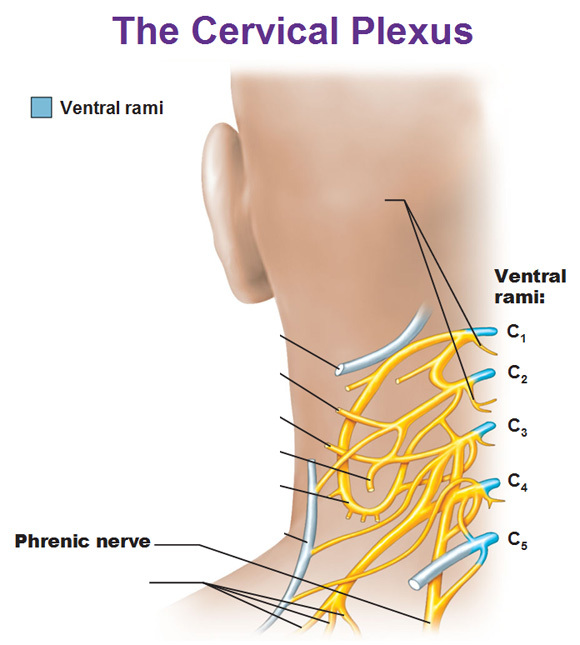 Why do we have an 8th pair of cervical nerves if we only have 7 cervical vertebrae you ask? Well because we start at the top of the atlas and all the nerves are in between the vertebrae so the 8th pair is in between C7 and T1. Note the difference between roots and rami (ramus is singular). The rootlets extend out of the spinal cord medially and combine to form roots. 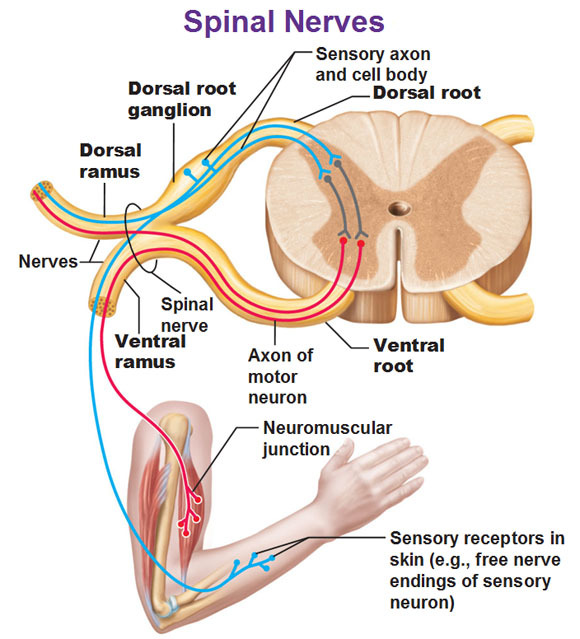 The roots combine to form the spinal nerve and then they split apart again and are now called rami (ramus for singular). 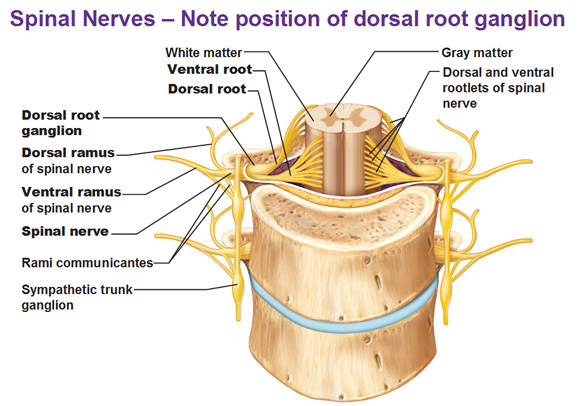 The dorsal root is posterior to the ventral (front) root. 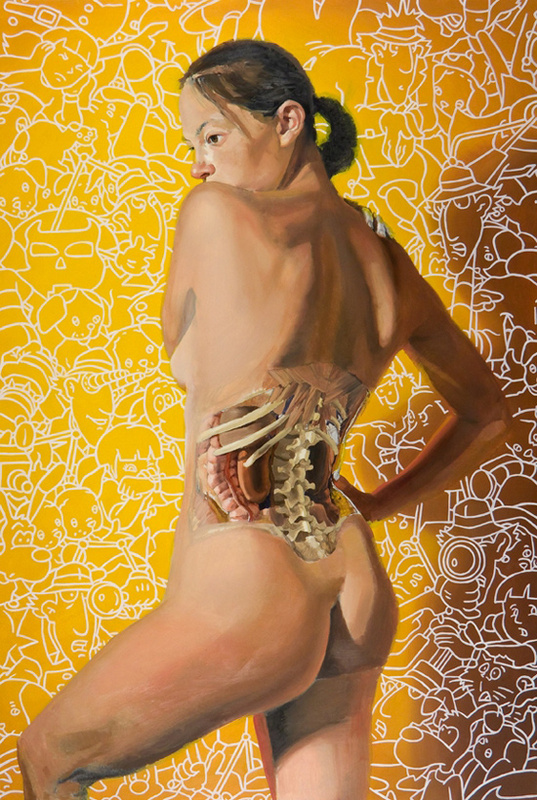 The dorsal rami innervate the deep muscles of the back for motor control, such as the erector spinae and also a horizontal strip of skin for sensory input. 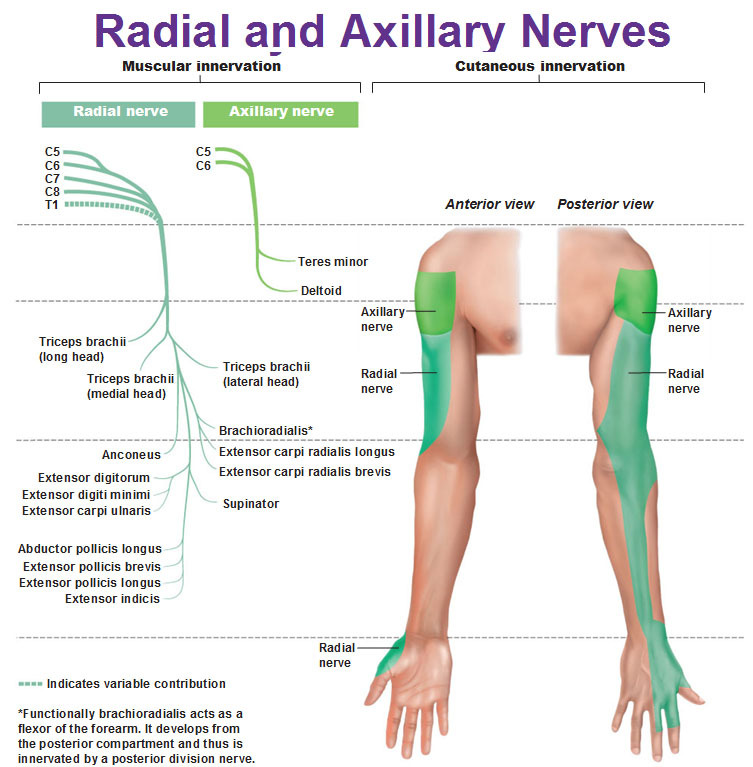 A nerve plexus is a network of nerves that seem to be tangled that mostly serve the limbs. 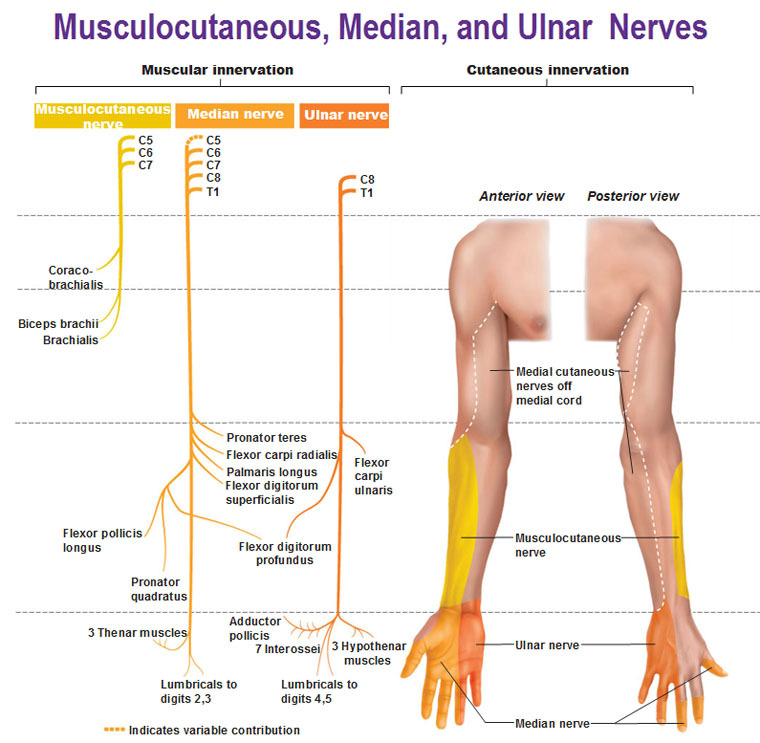 Each network is a network of nerves that come together and then redistribute themselves out with a different distribution of nerves into the limbs. They are made from the rest of the ventral rami (that is, from other than the thoracic region that we haven’t talked about yet). 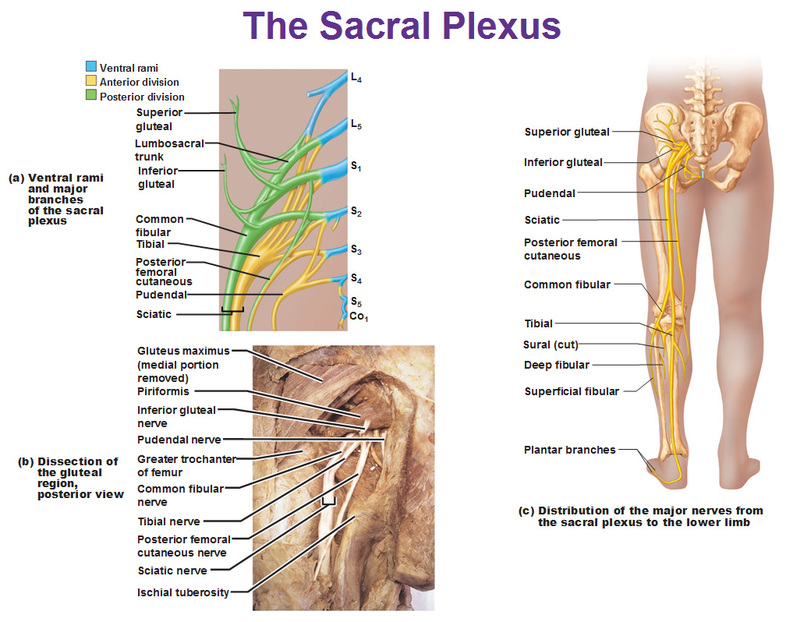 Each end of each plexus contains fibers from several spinal nerves. The fibers from each ventral ramus travels along different routes so that each limb muscle receives innervation from more than 1 spinal nerve to have a backup plan in case of injury. This plexus is located underneath the sternocleidomastoid muscle (from C1 – C4). Most of the branches innervate the skin of neck and deep neck muscles. 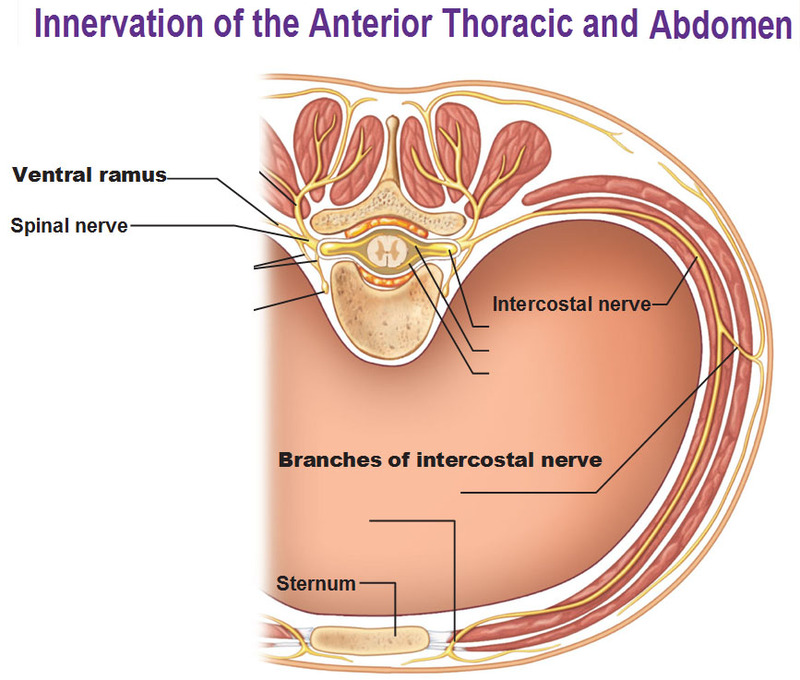 The Phrenic nerve (C3, C4, C5) gets special mention that innervates the top of the diaphragm (after traveling down through thoracic cavity, along either side of the heart). 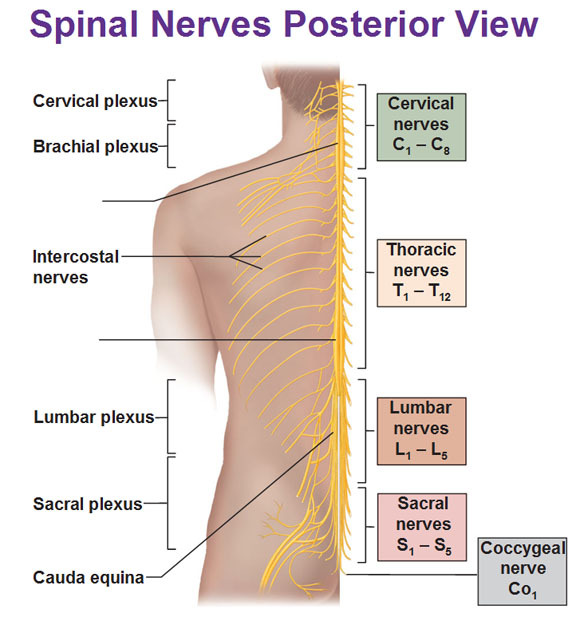 Note that if both phrenic nerves are cut or if the spinal cord is severed above C3, breathing stops. 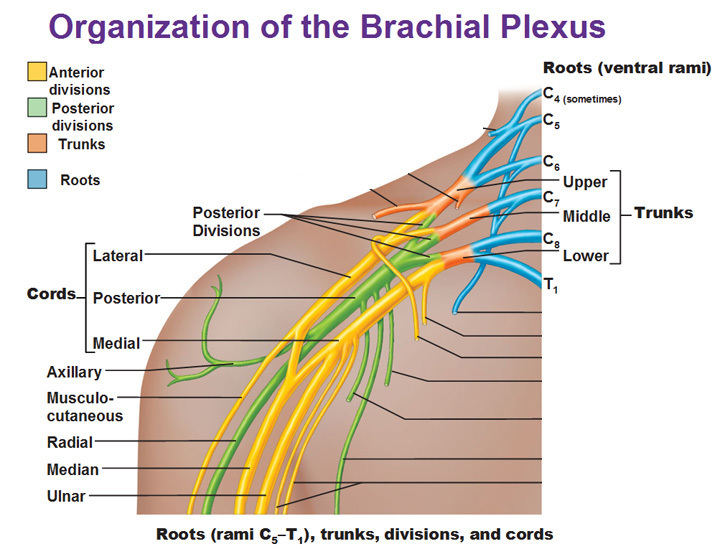 This plexus gets contribution from the transitional area from neck into armpit (axilla) between C5 and T1. 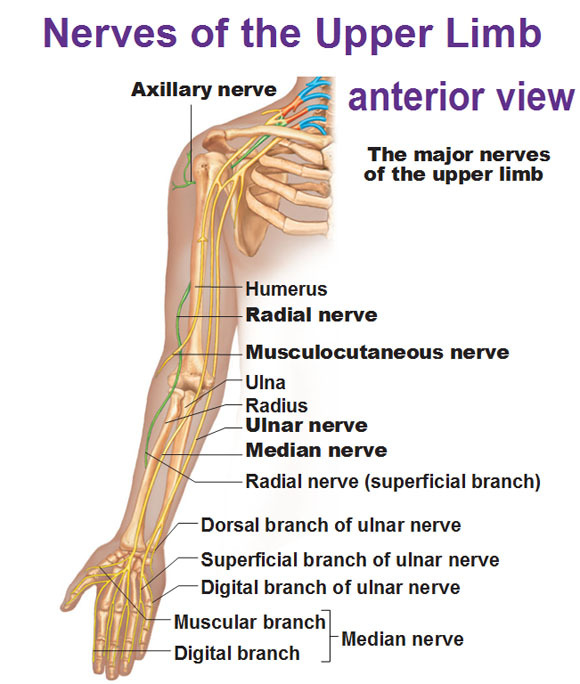 It provides almost all the innervation of the upper limb (this includes back and scapular muscles that control the limb). The organization of this plexus is also very messy. There’s mixing of branches and then a branching of branches and then mixing again. Note how there’s divisions, trunks and roots. 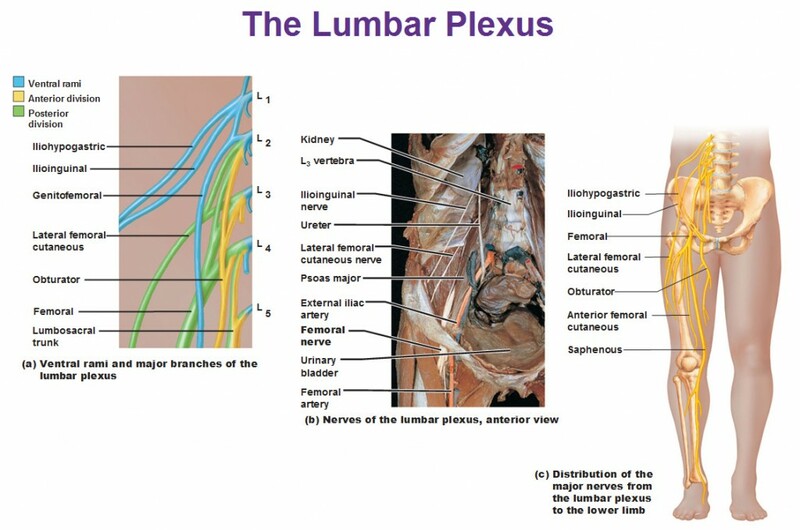 This plexus lies within the iliopsoas muscle and comes from between L1 and L4. The main branches innervate the anterior thigh. Smaller branches innervate some of the abdominal wall and iliopsoas muscle. 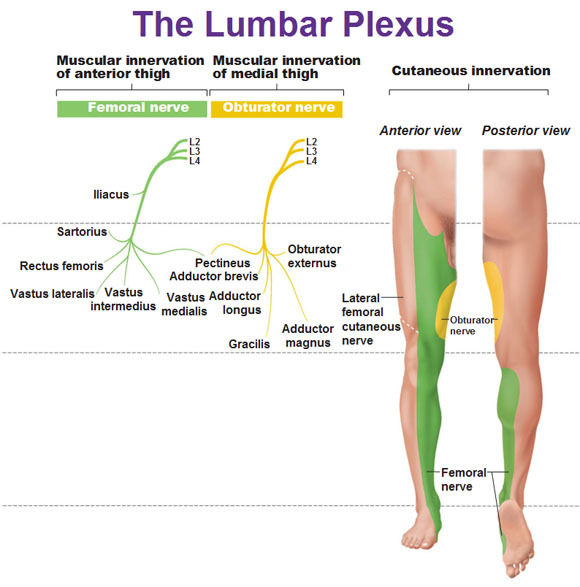 The sacral plexus lies caudal to the lumbar plexus (stems from L4 to S4) and is often referred together withthe lumbar plexus as the lumbosacral plexus. The branches innervate buttocks, pelvis, perineum and lower limb (except for anterior and medial thigh). And that’s that! 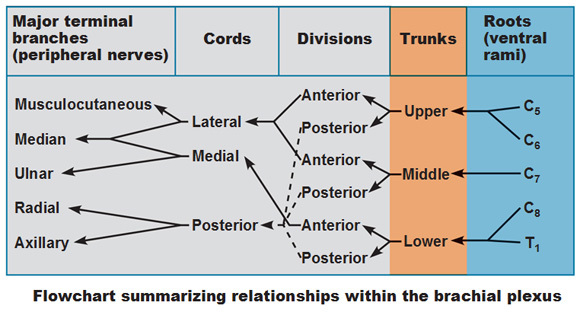 Look into the next article about dermatomes for a continuation of the spinal nerve discussion and find out what area of skin is innervated by which spinal nerve.